"Don't cling to me," Jesus said, "for I haven't yet ascended to the Father. But go find my brothers and tell them, 'I am ascending to my Father and your Father, to my God and your God.'" Mary Magdalene found the disciples and told them, "I have seen the Lord!" Then she gave them his message. 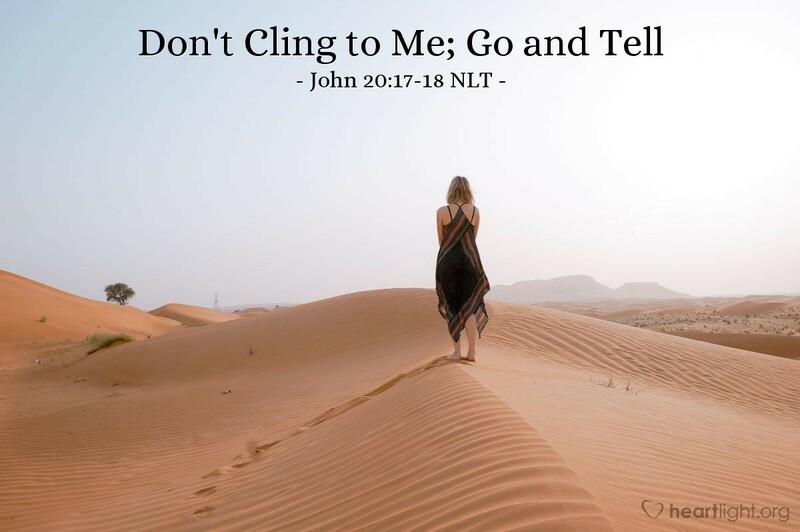 One of the biggest tasks we have as Jesus' disciples is not to cling to Jesus — not to cocoon ourselves in church where we feel the presence of the Lord but avoid going to tell others about him. We have a message of hope and a never-ending life to share with others who are trapped in hopelessness and despair. As disciples, we are not to spend the majority of our time in holy pep rallies, but in the world, touching its hurt and offering hope in a Jesus who lives in us and can live in them. Jesus accompanies us when we go and share that message and when we go and serve those who are broken just as much as he does when we meet together as his people. So let's get out there and give others his message in word and deed. Father, help me not be just part of a watered-down faith that spends so much time on sharing Jesus with itself and avoids entering the world to serve as Jesus served and to show by our actions that Jesus is alive today. Help me share Jesus' message with those around me, not arrogantly or self-righteously, but with genuine concern and through authentic service. In Jesus' name, and for Jesus' sake, I pray. Amen.